One of the things we love about Gunpla are how affordable they are to build. Your average High Grade kit only costs around $20. Of course, for that kind of money, it’s no surprise that the plastic can often look cheap and toylike. Top coat comes in gloss, semi-gloss, and matte finishes, but for the purpose of Gunpla, I highly recommend using a matte finish. The plastic is already glossy out of the box! 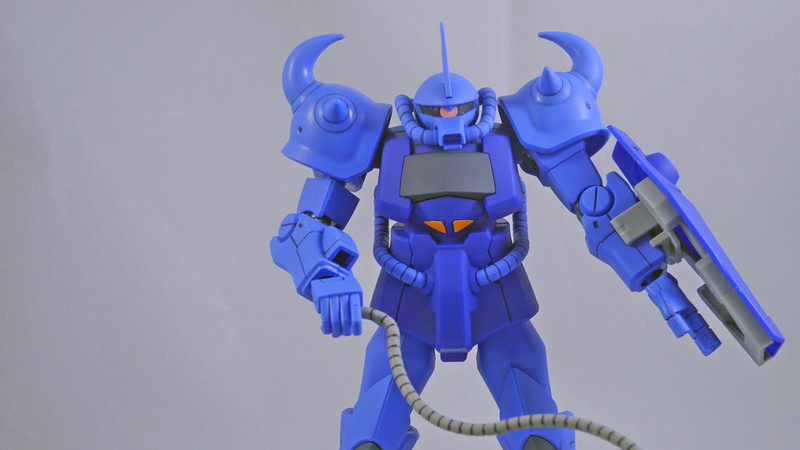 One of the reasons my top-coated Gouf looks nicer than the original is because the matte top coat dulls blemishes that would otherwise stick out a lot. For example, after I cut the nubs with an X-acto knife, I filed the plastic down with fine grit sandpaper. Normally, I wouldn’t do this because look at the scuff-marks it leaves! But matte top coat conceals that entirely. A Gunpla model of your choice. A top coat spray! I used Mr. Super Clear Flat Spray at the recommendation of friends to Gunpla 101 Ashe Blitzen and Milky, who both prefer it. There are other matte options available, including Tamiya Flat Clear. 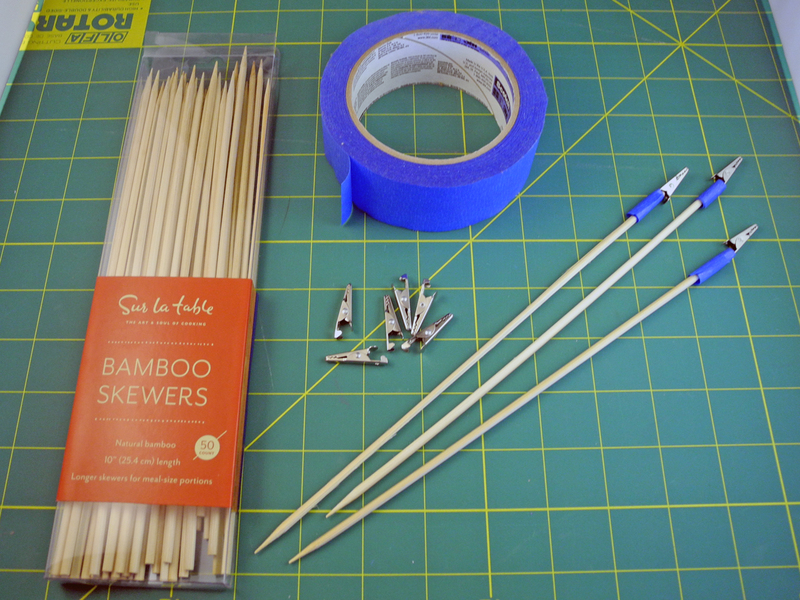 Bamboo skewers, tape, and alligator clips. We’re going to use these to prop up our pieces for spray painting. I made my own by buying kebab skewers and small alligator clips and combining them with painter’s tape. But if that’s too much trouble, you can buy alligator clip and bamboo painting sticks already assembled for hobby painting! A big old block of styrofoam. I included a link to where you can buy it, but I actually found my chunk of foam in the recycling bin behind my apartment building. 1. 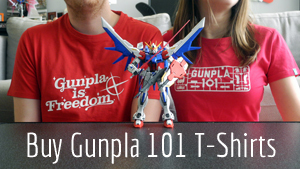 The first thing you need to do is build your Gunpla. Take extra care to shave down the nubs and use sandpaper or even a nail file to make sure they’re smooth. Our top coat will cover up imperfections from scrapes or cuts, but it won’t hide bumps and lumps from nubs. 2. Panel line your model as you normally would, if desired. If you’d like a review course on panel-lining, I’ve got one right here! 3. You can apply stickers now, or you can wait until you’re finished top coating. The difference is that if you apply the stickers now, they will not be shiny at the end. If you want matte stickers, now’s the time to apply. It’s also, of course, much easier to put stickers on during the building process. I personally applied all of the Gouf’s stickers at this time. 4. Now it’s time to actually get into the top coating part of this tutorial. 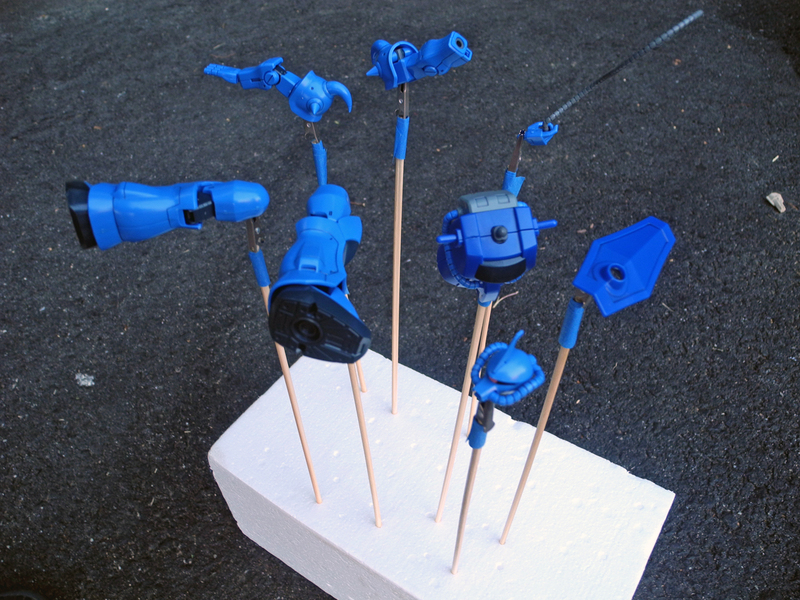 You want to break your Gunpla into a few big parts for painting. Here, I’ve given the arms, the legs, the head, the torso, the shield, and the hand holding the whip their own sticks. Important: Be sure to attach the part to the stick in a place you do NOT want spray painted, like a connector piece or an inside part that won’t show. 5. Stick your sticks into the foam block and go to an extremely well-ventilated area, by which I mean outdoors. (Unless you have a spray-painting booth, but if you’ve invested in that, you already know!) Since I live in an apartment building, the parking lot worked for me. 6. 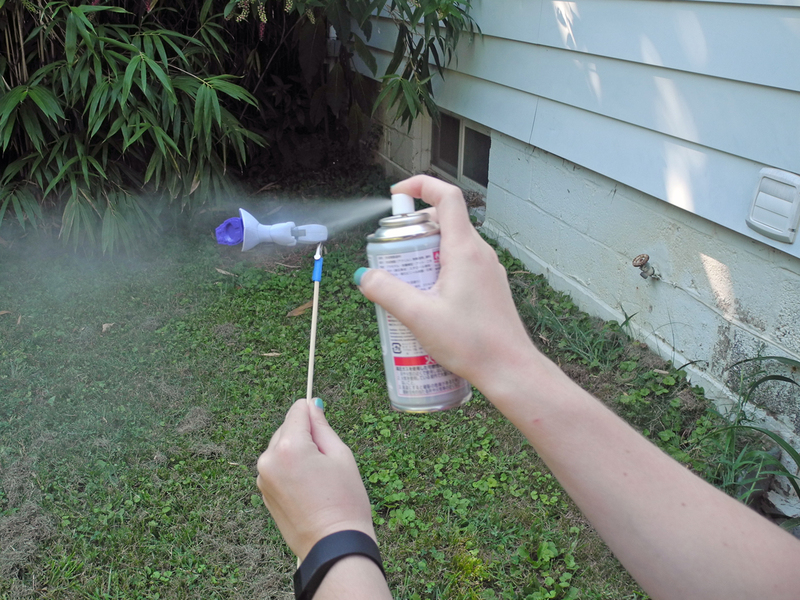 When you are spray painting, you want to hold the spray bottle and Gunpla parts far away from yourself in order to avoid inhaling the fumes. You also want to hold the spray bottle and the Gunpla part about six inches apart from one another. I didn’t get a photo of myself spray painting the Gouf, so here’s a photo of me spray painting a Gyan in my friend’s backyard. If anything, I am holding the spray bottle and the Gyan part a little too close to one another. I recommend spraying while turning the part in your hand for about 2 to 5 seconds to ensure that you get an even coat. A little goes a long way. You want to lightly and evenly coat the model. You can always add more, but you can’t hit undo if you added too much and it got clumpy. Voila! 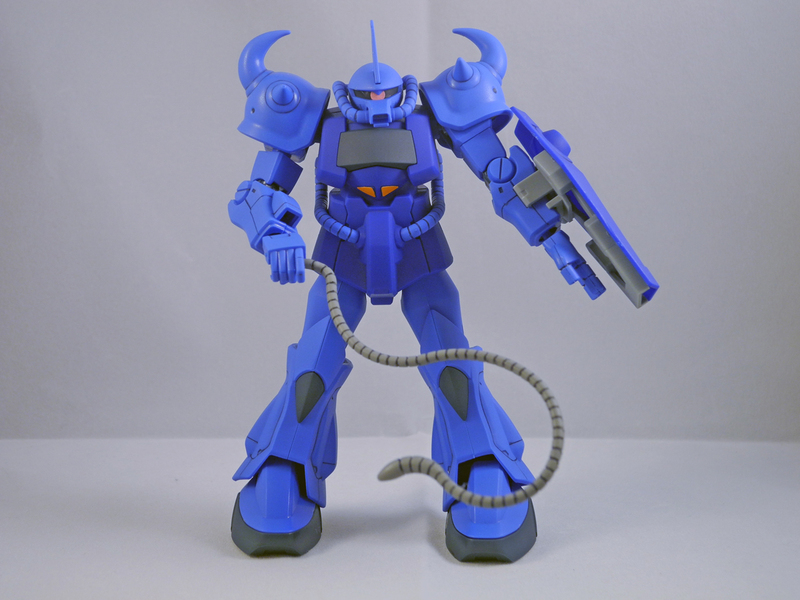 That’s no Zaku, boy, it’s a beautifully top coated High Grade Gouf that I bought for about $9 but which looks like it’s worth way more than that. 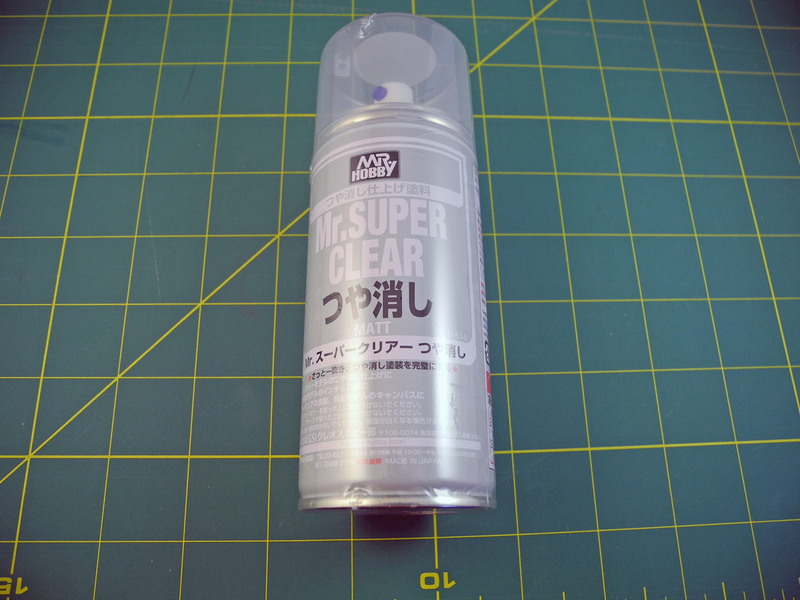 Matte top coat is the ultimate finishing solution for beginning Gunpla builders. It’s inexpensive, it doesn’t take much time, and it goes a long way toward forgiving and concealing your mistakes. I hope you found this tutorial valuable. Please share your top coat questions and experiences with me in the comments!